Lucille spaces out over the kitchen sink, lost in the problems the town is facing. In the living room, Jenny and Jacob watch television and Jacob grabs his head in pain. Lucille heads to the porch to check on Fred and Henry and report that Rachel is coming along. Fred has yet to hear anything new from Bellamy. Margaret uses this opportunity to sneak into the house. Maggie leaves Rachel for a few moments, as downstairs, Lucille prepares to usher the kids off to bed. Jacob is clearly not looking good and says that his head hurts. When Lucille leaves the room, Jenny questions why Jacob didn't tell his mother what is really going on. Upstairs, Margaret sneaks into Rachel's room and locks the door. Rachel is shocked to see Margaret, who says that she has come with a message from Preacher James. Margaret asks Rachel how she would like to be with Tom again. At the church, several men lock Bellamy into a closet. Bellamy demands to be let out but Preacher James informs Bellamy that despite his belief that they would accomplish their mission together, Bellamy has proven himself untrustworthy. Bellamy questions if the purpose is to kill a baby but Preacher argues that if Rachel's baby brings millions of Returned back, the world will not survive it. At Twain's, Elaine listens in as Joey angrily talks to more Returned haters about the threat that Preacher James poses. Joey is concerned that Preacher James can bring back people who have died and threatens that if he sees Preacher James doing that, he is going to give him a one way ticket home. Of course, this makes no sense because the Returned cannot be killed. Preacher James enters Twain's and tells Joey and his friends that though they believe he is the enemy, tonight they have a common goal. Bellamy grabs one of the pipes from the ceiling in the supply closet. At the Langstons', Maggie tries to open Rachel's door, only to find it locked. Though Maggie knocks, Rachel does not answer. Bellamy manages to loosen a pipe and then uses the pipe to break the window in the door. Bellamy then reaches through the window and unlocks the door, before taking off running. Maggie heads out to the porch to tell her father that something is wrong and Rachel's door is locked. Fred races into the house and bangs on the door but Rachel again does not answer. Fred kicks the door down to find his mother in the room. Fred makes it clear that Margaret has no business being here, before grabbing her by the arm and pulling her out of Rachel's room. Maggie checks on Rachel, who is experiencing contractions. Fred brings Margaret downstairs and Margaret begs Jacob to tell Fred and Henry about the baby. Henry is livid and tells Margaret that he doesn't get to speak to his son. Margaret is adamant that Rachel and her baby are hurting Jacob. Lucille heads downstairs and Jacob is so terrified by the yelling, he simply stands there. Lucille orders Margaret removed from the house. Bellamy bursts in and tells everyone that they have to move Rachel because the preacher is coming. When Fred escorts Margaret outside, he finds a group of Returned headed to the house lead by none other than Preacher. Margaret tells her sons that this is what she was trying to prevent. Henry suggests that they all return to the house and Frank tells his mother that she chose her side. Henry, Bellamy and Fred head into the house, closing the door on Margaret. Margaret rushes to Preacher James, demanding to know what he is doing and reminding him that she promised to take care of this. Preacher James points out that Margaret failed in her mission. Upstairs, Jenny wonders why the house is surrounded by Returned and Jacob says that it's all his fault. Outside, Margaret admits to Preacher James that she ran out of time and adds that he is going to have to do it. Preacher James calls out to Bellamy, claiming to be a man of peace but suggesting that his hand not be forced. Preacher James calls out that Rachel is to be sent out so that they can all go home. Bellamy gets on the phone trying to reach his government contact (read: Angela) but what he doesn't know, is that the facility has been completely abandoned. Fred calls the station and the phone is answered by none other than Joey Nolan. Joey has taken over the station and some of his men hold the cops at gunpoint. Joey again asserts that the Returned are not natural. Joey tells Fred about his meeting with Preacher at Twain's, and warns Fred that he shouldn't expect any help from any cops tonight before hanging up. Fred tells Bellamy and Henry that they are on their own now. Upstairs, Rachel paces around the room, asking if the preacher is here. Maggie tells Rachel to focus on having the baby, adding that everything is going to be fine. Rachel responds that everything is not fine and asks how she is expected to feel safe, when everyone is lying to her. Maggie concedes Rachel's point and tells her about the Returned waiting outside. Maggie then assures Rachel that her baby will be born and that all she has to do is stay strong. Downstairs, Bellamy informs Fred and Henry that Preacher James thinks that Rachel's baby is some kind of demon. Since Rachel cannot be killed, the plan is to make Rachel disappear before the baby can be born. Fred decides to head outside but Henry stops him, saying that it should be him because he has a connection with Preacher James. Henry heads outside and Bellamy and Fred take up position behind him to cover his back. Henry makes his way over to Preacher James and says he doesn't understand what is going on. James calls Rachel's baby a demon and states scripture. Preacher James asks what happens if the next time the baby takes control, it turns Henry against his fellow man or his wife. Henry makes it clear that Preacher James doesn't have the right to decide what is good or bad, or who should live or die. Margaret intervenes, to once again argue that the baby is hurting Jacob. Henry cuts Margaret off, telling her that she no longer makes decisions for the family. Preacher James asks Henry if he is prepared to lose Jacob again but Henry says that he is not going to sacrifice someone else's child for his own, adding that Preacher James preys on people's weaknesses. Henry heads back into the house and Lucille comes downstairs. Henry says that Margaret truly believes that the baby is hurting Jacob and though Fred says that Preacher James is pulling everyone's strings, Lucille heads upstairs to check on Jacob. Henry then says that the baby has not known anything but death and is not like them. Bellamy reminds Henry that no one was willing to give them a chance but Henry points out that they don't really know what is going on and that no one does. Henry asks what if the baby being born is the beginning of the end. Fred advises Henry not to give into fear like he did. Henry reveals that Preacher James has demanded that Rachel be handed over the in the next ten minutes, or they will enter the house. Upstairs, Lucille checks on Jacob, who says that he didn't mean for this to happen. Lucille questions what is making Jacob not feel well and he admits that he hurts when the baby hurts. Jacob starts to bleed from his nose. Downstairs, Lucille tells Henry that she wants to leave with Jenny and Jacob. When Henry balks, Lucille informs him that Jacob admitted that it's the baby who is hurting him and adds that the children should not be in the house, if the house is to be stormed. Henry does not want to take this option but Lucille is adamant that the children need to be protected. When Bellamy and Fred enter the room, Henry informs them of Lucille's decision to leave with the kids and suggests that Fred join her. Fred says he is not leaving while Maggie is still in the house. Lucille brings the children downstairs and Bellamy pulls Jenny aside for a hug and to tell her not to be afraid. Jenny says that it is her job to tell Bellamy that because though he is an adult, she is still his big sister. Fred opens the door and Lucille heads outside with the children. Lucille and the kids slowly make their way through the crowd and when one of the Returned moves to grab Jacob, saying that Jacob could be used to get at Rachel, Margaret quickly intervenes and says that Jacob is her grandson. Margaret assures Jacob that he won't have to worry about the baby anymore and Jacob says that he didn't want this and didn't mean for the baby to get hurt. Lucille continues forward with the children and Preacher James tells Margaret that in time, she will be thanked for what she did. Bellamy, Fred and Henry head back into the house as outside, Margaret warns that they are not going to give up without a fight. Inside, the men bar the doors and load their guns. Fred tells Henry the less thinking the better but Henry is concerned about what he should do if it's their mother who enters the door. Bellamy tells Rachel that she is to stay in Rachel's room and not leave no matter what she hears. Maggie kisses Bellamy, after he admits that he will be thinking about her. Maggie elicits a promise from Bellamy that he will be careful. A rock is thrown through the window and Fred orders that anyone who comes through the door is to be shot. Outside, Preacher James marshals the Returned and they start to march towards the house. Henry is concerned about whether or not he can shoot someone but Fred advises that Henry remember that whomever he shoots will come back. Bellamy and Fred both yell for the Returned to stay back, warning that they will shoot. Preacher James calls out to the Returned that they cannot be killed. Fred fires his weapon, wounding one of the Returned in the thigh. The Returned burst through the living room window and the back door causing Henry, Bellamy and Fred to be quickly over run and disarmed. The Returned rush upstairs and Maggie grabs a pair of scissors for protection, telling Rachel to stay strong. Rachel cries, as Maggie tries to tell her that she can do this. Two Returned burst into the room and downstairs, Maggie can be heard screaming no. Fred breaks loose, screaming his daughter's name and desperately tries to fight his way upstairs. Maggie is brought downstairs and Fred tells his daughter that it's going to be okay. Preacher James enters the house and pauses on the stairs to tell Bellamy that he created this situation before climbing the stairs. Margaret stands in the house, clearly overwhelmed by what is going on. Preacher James makes his way to Rachel's room and closes the door. Rachel asks why the Returned are here and what she did to deserve this. Preacher James tells Rachel that she is never going to be accepted and that the cause for coming back is pain. Preacher James brings up where Rachel was before she came back and Rachel says that she had dreams. Preacher James suggests that Rachel shouldn't bring a child into a world which has been defined by pain and that in the other place, it's all peace and joy. Rachel brings up Tom and Preacher tells her that Tom is waiting for her and if she goes to him, all of her suffering will end now. Rachel has another contraction and Preacher advises her to let it all go and says that Tom is waiting for Rachel to join him. Rachel says that she is scared and Preacher tells Rachel that she, Tom and the baby can all be together. Downstairs, Marget kicks the two Returned guards out of the house. The moment they leave, Margaret frees Bellamy and says that she told Preacher how to make Rachel and her baby disappear because she was only thinking about Jacob. Bellamy bursts into Rachel's room and orders Preacher away from Rachel. Rachel says that Tom is waiting for her and the baby but Bellamy yells that this is what Preacher wants her to believe because Preacher believes that the baby is evil. Preacher James says that he has been sent by God to stop the birth of Rachel's child and Bellamy retorts that no child is born evil. Rachel experiences another contraction and in the distraction, Preacher James reaches for the scissors Maggie dropped, causing Bellamy to shoot him. Maggie and Fred run into the room and Maggie helps Rachel deliver, as Fred holds a gun on Preacher. The next morning, Maggie brings the baby to Rachel to nurse, as Bellamy watches. Maggie declares the baby perfect and Rachel thanks them both. Fred enters the room and tells Maggie and Bellamy that there is something they need to come and see. Fred, Maggie, and Bellamy, join Henry and Lucille in front of the television. The news is reporting on a mass Return all over the world. One year later, Bellamy sits in his office with a Returned, explaining to them how much the world has changed since she has been gone and informing her that her grandson has agreed to take her in. Bellamy warns that she will experience threats and intimidation. Bellamy now works for the Bureau of Returned. Henry and Fred are at Twain's and Henry invites Fred to come for dinner. Fred brings up the new bill in the congress about the Returned. Henry is bitter that he is paying taxes and cannot vote. Margaret appears outside of Twain's and looks in the window at her two sons. Henry's glaze lingers and Margaret walks away. Henry asks how Margaret is doing and Fred says that Margaret misses him. Bellamy goes to see Preacher in prison. It seems that Preacher is being kept in suicide watch and is not at all pleased. Bellamy informs Preacher that the world outside is still spinning. Preacher brings up the riots in Philadelphia and the fires in Tokyo. Bellamy points out that the world is not perfect and says that tolerance will not come over night. Preacher brings up the connection he shares with Bellamy and says that the end of time is upon them. Bellamy questions why the preacher doesn't just disappear and Preacher says that he choses to remain until he is called upon to fight the evil Bellamy brought into the world. Preacher then asks about Rachel's baby and is informed that he is a normal baby boy. Preacher is convinced that the child is Satan. Bellamy tells Preacher that he won't be visiting him anymore and Preacher says that he shouldn't have put his faith in a man who is ruled by doubt. Bellamy arrives late for dinner at the Langstons' and Maggie answers the door. Jenny rushes forward with a drawing Elaine made for him. Bellamy tells Maggie that he went to see the Preacher because at times, it's tempting to see the world in black and white and Maggie reminds Bellamy that people are looking to him for help. Maggie adds that none of them know why they are here. Bellamy greats Jacob, Lucille, Elaine, Fred and Henry, as they prepare to have dinner together. Rachel sings a lullaby to the baby before putting him to bed. When she leaves the room and turns out the lights, locusts appear at the window. At this point, it's very doubtful as to whether or not Resurrection will get a third season. The ratings have steadily declined since the premier of the second season. To that end, it seems that the writers were determined to tie up the series, which as a viewer I greatly appreciate. Rachel has had her baby, Maggie and Bellamy are together and the Returned are being integrated into the world. At the same time, the final shot with the locusts in the baby's window provides enough meat to build a third season on, should Resurrection be renewed. Part of the problem with Resurrection is that instead on focusing on the mystery of the Returned, it seemed to simply become a family drama. Though the acting was great, this is not what people signed up for and when it became clear what direction Resurrection had chosen, it lost its viewership. I still feel like I have no idea why people were Returning from the dead. I still don't know why and how the Returned are connected, nor do I have any idea how it is that Preacher James was able to bring back Henry. These are questions I which the writers had at least addressed. One of the things I like about the end of the season was the play on how easily fundamentalist religious conviction and fear can become warped and violent. I'm not sure that juxtposing that fear however to people like Joey Nolan made sense. Let's fact it, the living had a right to be afraid and not everyone who came back, was even remotely a good person. This is not to say that the Returned deserved violence but keeping one's distance makes sense to me. At the end, Margaret was a very pathetic figure. More than anyone, she lost what she valued most - her family. All Margaret has done is sacrifice for Henry, and Fred and in fact the Langston name and in return, she has nothing to show for it. Margaret looked absolutely pathetic staring through the window at Henry. The problem is that there was no reason for Margaret to keep the secrets she did after she returned. Everything she witnessed, she witnessed when she was a child and had absolutely no control over what was going on. The only reason the writer's had Margaret make the decisions she did it to keep the focus around the Langston family drama, rather than working on the mystery of the Returned. 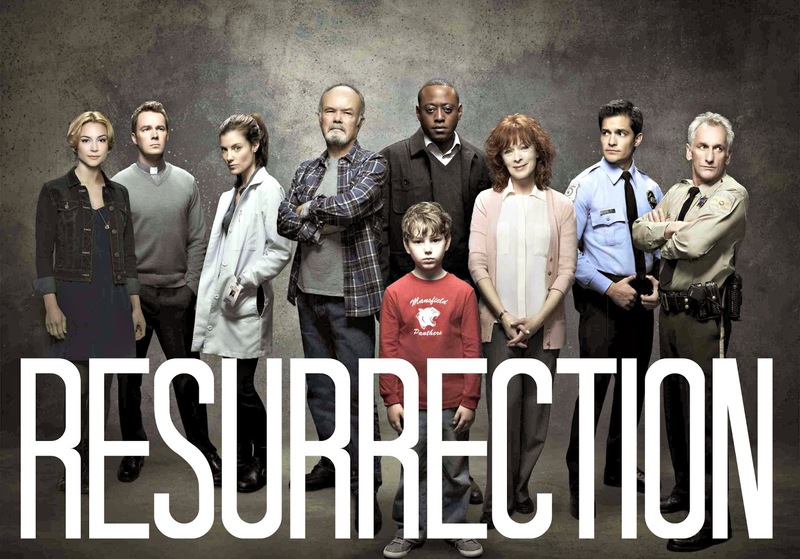 I would really have loved it had Resurrection been more diverse than it was. Bellamy essentially has been the only character of colour for the entire series and while I love Omar Epps, one character who never ever deals with race, really isn't inclusion. It really wasn't until this season that we saw another reoccurring character in the form of his older sister Jenny. It is however worth noting that the growing affection between Bellamy and Jenny was beautiful to watch. In terms of sexuality, Resurrection was also erased. Not even one of the Returned was GLBT? We were given no explanation and this is simply not acceptable. What Resurrection did have going for it, were central characters who were older. Frances Fisher, Kurtwood Smith, Matt Craven and Michelle Fairley all played important roles and were on screen pretty much quickly. It is a common thing to watch television with a show filled with young actors or at the very least older actors who look young for their age. It is something that stand out in Resurrection that these actors were central and less than because they weren't youthful in either age or appearance. It's a fact that often gets ignored in conversations about this show. I don't know if we will see a third season, especially given that another show based on the original French program will be airing soon. I do however hope that if Resurrection is granted a third season that it will have learned from the low ratings of season two and focus on the mystery of the Returned.